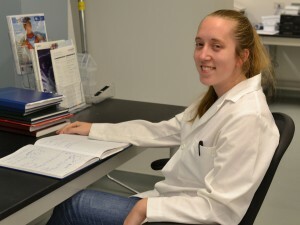 Her Syracuse University experience is being shaped by time spent immersed in research in the Syracuse Biomaterials Institute (SBI) and applying her leadership strengths in the Women in Science and Engineering Future Professionals program, the Syracuse University Chapter of the Golden Key International Honor Society and the Engineering and Computer Science Graduate Student Organization. My father passed away when I was 7, and I lost my grandfather at 12. While I was initially drawn to the idea of attending medical school, my experiences with undergraduate research drove my desire to explore cutting-edge cancer treatment development. I quickly learned that academia offered a unique mechanism to not only foster my own research interests, but also inspire the next generation of young scientists and engineers. The people. I have met and collaborated with a diverse group of individuals throughout my time as a graduate student. I have had the opportunity to work with a broad range of undergraduate, graduate and professional researchers all interested in developing new applications for their respective fields. Who has had influence on your academic trajectory? My primary advisor, Professor James Henderson, has been a driving force behind my graduate research success. He has consistently provided me with guidance to foster my technical abilities and has granted me the opportunity to expand my mentoring skills and professional network through various department, University and national opportunities. My research looks at improving control and understanding of the cellular microenvironment with a focus on hindering or enabling cell migration behaviors. Within the body, cells are constantly responding to various physical and chemical cues which dictate the behaviors they display. More specifically, reorganization of the extracellular matrix (ECM), the natural scaffolding that cells sit on, interact with and secrete, has been shown to critically alter migration, adhesion and morphological behaviors. On the broad scale, disruption of ECM influences disease states, wound healing and proper development. My thesis work focuses on the use of smart material designs to alter the cellular microenvironment and on developing new computational tools and analyses to quantify changes seen in cell migration behaviors. The bioengineering program at the University has granted me multiple opportunities to collaborate with young and experienced researchers across multiple disciplines. This ability to work in an interdisciplinary environment will be crucial for my future career, as cross-collaboration becomes more prominent in industry, government and academia every day.